Did I catch your attention? Did she say that creative writing is for everybody? Really? I put my money where my mouth is, not only in my own writing, but in working with kids of all ages on theirs as well. Two years ago I began working alongside Writopia founder Rebecca Wallace-Segal in New York City, and last summer I was thrilled to be trusted to spearhead the Writopia movement in Northern Westchester when I moved to Katonah. Now I am equally excited to help foster the Writopia growth throughout Southern Westchester as it's program manager. Creative expression isn't just for those who have confidence in their own creative juices, in fact it's just as important for those un-inclined, to fall in-love with some aspect of personal expression. 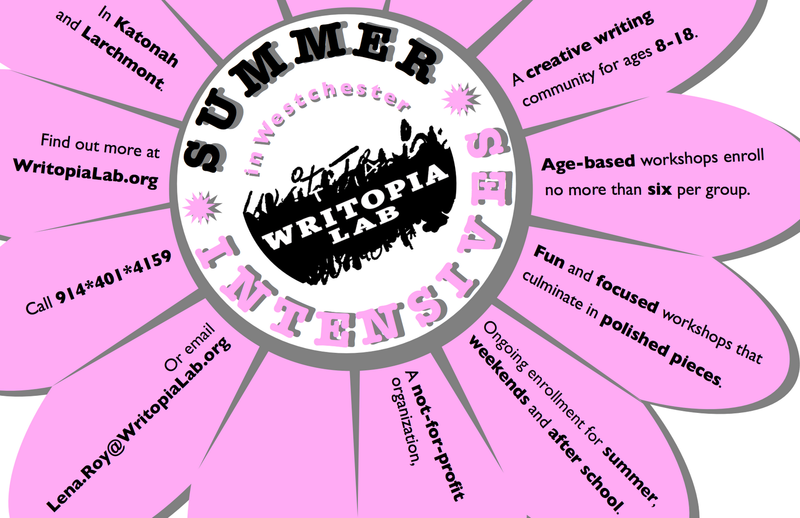 As Writopia Lab continues to grow in Westchester, our partnerships with local libraries, schools, and bookshops remain crucial to how our writing community fits within the broader network of institutions that advance literacy. Because of this, I'm afforded frequent opportunity to interact with many like-minded kids, educators and authors. They, along with the many enthusiastic librarians and booksellers I meet, sometimes make it easy for me to forget that not everyone sees value in learning the art of written expression. Yet I am sometimes asked why creative writing should matter at all for kids who are not considered predisposed in some way as writers. Anyone can find recycled surprise luggage along with surprise canisters plus recycled replica chanel cards to apply during christmas time. After you supply somebody something so you use it in a very package using having to wrap cardstock or maybe a compensate handbag will certainly using chanel replica handbags structure cardstock all of which will includea minute card along with the bag you happen to be squandering a good amount of cardstock and so injuring many all-important bushes. This specific a lot of cardstock that is missing, especially when you approach precisely how short-term this specific cardstock can be along with precisely how choosing only fake chanel removed. For most examples these kind of surprise luggage along with packing containers are only only taken off involving without delay. The good news is, by making use of recycled surprise luggage along with recycled surprise packing containers about to catch sacrificing omega replica pretty much everything cardstock. In case you obtain recycled surprise packing containers along with luggage you happen to be staying eco- warm and friendly along with won't be chanel outlet totally wasting wooden, you happen to be employing recycled cardstock that will has already been applied previous to.